Reinforced by technology advancements and increased usage of smart devices, today, mobility is connecting end users like never before. As businesses rely more on connected devices, IoT and Big Data Analytics have attained an inevitable role in enterprise mobility realm by revamping business in terms of efficiency, productivity and decision-making. Perceiving the significant relevance of enterprise mobility solutions in today's business ambience, skilled technology players are crossing the threshold of mobility landscape with their strong technology expertise, domain knowledge and high customer centric approach. Pune headquartered NSquareXperts, a software services company, is one such player who concentrates on cutting edge technologies, domain knowledge, quality and cost-effectiveness to offer best of breed enterprise mobility solutions. Essentially, it delivers both iOS and Android Application Development. "Being a software services provider, it becomes imperative for us to be technology driven and domain-focused. We are consistently evolving to achieve formidable domain expertise and platform adroitness for delivering more cutting edge mobile solutions to meet our clients' needs,” unveils Nilesh Kankariya, CEO of NSquareXperts. Aside from enterprise mobility solutions, Nsquare offers a services portfolio which incorporates CRM, Product Engineering Services, Web Design & Developement, UI/UX Design, Data Integration and Migration. Currently, it aids eCommerce, eLearning, Healthcare and Travel and Hospitality domains. technological changes/newer trends, helps it stay abreast and expand its knowledge horizons. Paying attention to critical management elements such as version, application catalogs, performance analytics, security and life cycle management, helps Nsquare ensure quality and scalability to solutions”, adds Nilesh. Further more, it reinforces clients with qualitative solutioning, balanced pricing and value adds. With a team of high prowess in application development, Nsquare develops iOS Applications for eCommerce, IoT, Appointment booking (Healthcare), Food Delivery, Event Management and Bus Booking. “We have expertise across Payment gateway integration (CCAvenue, Paypal), SMS Gateway integration, Google Map and Location services, Quickblox Message gateway integration etc. Additionally, we have capabilities in offline data handling and offline map integrations," explains Nilesh. "Besides, NSquare has developed Android apps for a range of domains including eCommerce, Education, IoT, Healthcare, Food, Entertainment, Event Management, Travel and Lifestyle,” adds Kirit. It utilizes Android Studio for development. The use of devices with various resolutions and sizes for testing, helps Nsquare provide robust and scalable apps to clients. Nsquare aims to become a company built on Technology, Domain skills, Geography presence, Customer as well as Employee centricity. 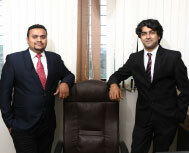 “We have strategic partners based out of USA, UK, Dubai and Singapore. We plan to increase our presence which would allow us to have a better reach, understand markets and address clients' demands,” concludes Kirit.